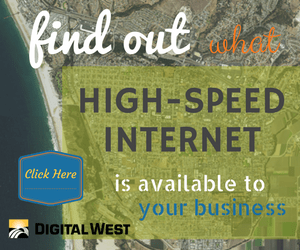 For more than a decade, Digital West has been investing in the technology infrastructure of the California Central Coast, including developing the area’s only pure fiber optic network. Fiber optic technology is exponentially faster, more reliable and has lower latency speeds than DSL or copper cable. It also provides the necessary foundation for streaming videos, transferring large amounts of data or doing business in the cloud, which makes it the preferred choice for businesses that demand the best. We also partner with fiber carriers across the country to help businesses with multiple locations stay connected and secure. What is fiber and how it it different? Fiber optic communication works by sending small binary transmissions of light down a fiber optic wire. At each end of the fiber optic infrastructure there is a computer, repeater or optic amplifier that makes sense of the signal so it can continue down the network. Fiber optic technology is exponentially faster, more reliable and has lower latency speeds than DSL or copper cable. It also provides the necessary foundation for streaming videos, transferring large amounts of data or doing business in the cloud. How do you connect my business to fiber? Digital West has a fiber loop running all around San Luis Obispo, so chances are you’re already in a fiber-lit building. If that’s the case, it’s easy for us to “turn up” fiber to your office quickly. Other businesses may be near our loop but not already connected. In this event, we’ll send someone out to do a quick site survey of your building so we can determine the best way to make the final linkage from the loop to your building. Ninety-nine percent of the time, this involves using existing conduit, but occasionally we will need to dig a small trench or install an aerial connection. We take care of all of the permitting, construction and clean-up, and your fiber will be up and running in a matter of days or weeks, depending on your location. Find out if fiber is in your area. We also partner with fiber carriers all over the US and abroad. You can work directly through us to get set up and take advantage of our 24/7/365 live tech support. You can also take advantage of our other services and receive just one monthly invoice. If you have more than one location, we’ll help you set up and manage your multi-location network. What is a building entrance agreement and what can I expect during construction? A building entrance agreement merely provides entrance access to your building(s) in order to improve the infrastructure by connecting your building(s) to the city-wide fiber optic cable ring. There is no obligation to purchase the actual fiber services if and until you or your tenants need it. Digital West will, at our expense, trench and place all required USS and cables. We will make every effort to minimize disruption during construction. If damage does occur, DWNI (and/or our contractor(s)) will make all reasonable efforts to repair property with the goal of returning it as close as possible to its original state – including but not limited to any damage to landscaping, sidewalks, walls, etc. Get the agreement. We have a simple pricing schedule for fiber. It includes a one-time service turn-up fee to cover the costs of construction, installation and hardware. Then, you’ll pay a flat monthly service fee depending on whether you are a single tenant or part of a multi-tenant building. We generally require a multi-year contract to cover the costs of construction, which are only partially represented in the turn-up fee.